Emmerson Mnangagwa took the oath as Zimbabwe’s president in front of a stadium crowd on Sunday after a divisive election, as US observers of the vote questioned the country’s democratic credentials. 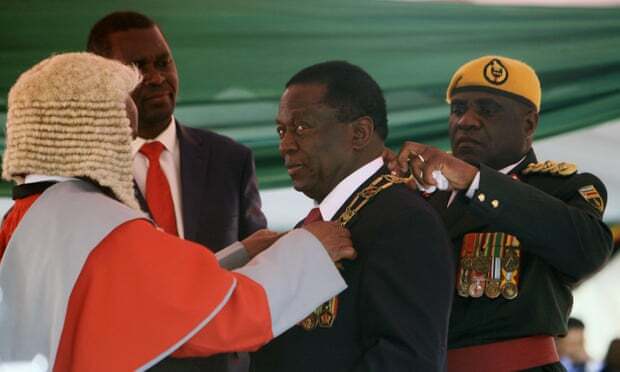 The constitutional court confirmed Mnangagwa as president in a ruling released on Friday, dismissing a challenge by the opposition leader, Nelson Chamisa, who he defeated in the 30 July ballot, reports The Guardian. Thousands of people, some bussed in from outside the capital, joined foreign leaders at Harare’s national stadium for the inauguration of Mnangagwa, who narrowly secured the 50% of the vote he needed to avoid a runoff against Chamisa. He took the oath before the country’s chief justice, Luke Malaba, whotogether with eight other constitutional court judges had dismissed Chamisa’s petition. The election was seen as a significant step toward shedding the reputation Zimbabwe gained under Mnangagwa’s predecessor Robert Mugabe, and securing international donor funding to revive the country’s crippled economy. Hours before the inauguration, however, US observers from the International Republican Institute and the National Democratic Institute said Zimbabwe lacked a “tolerant democratic culture” in which political parties were treated equally and citizens allowed to vote freely. The election was marred by procedural lapses and was followed by an army crackdown against opposition supporters that undermined promises Mnangagwa had made during the election campaign to break with the corruption and mismanagement that became endemic under Mugabe. The crackdown, in which six people died, recalled the heavy-handed security tactics that marked the 37-year rule of Mugabe, who was removed in a coup in November. Washington has maintained travel and financial sanctions on senior officials of the ruling Zanu-PF party, including Mnangagwa, and some state-owned firms. US support will be key to Zimbabwe securing any funding from the International Monetary Fund. The European Union has progressively removed sanctions, which now only remain on Mugabe and his wife Grace.